The workhorse of the electromagnetic protective relays is the induction disk type, which is used to provide a time delay function after pickup with a delay that corresponds to one of several inverse time characteristics that differ by the amount of steepness in the curve. The induction disk relay requires calibration to obtain accurate pickup and time characteristics that follow closely to that shown on the manufacturer's time current curve. Various things can happen over time to cause the relay to out of calibration, so retesting is needed periodically to check operation and adjust as needed. A microprocessor relay has self-check features for various aspects of its operation and can signal an alarm when it is not operating properly. Microprocessor relays can provide several inverse time curves to select, whereas the electromagnetic induction disk relay must be replaced with another model to change inverse time curves from one standard curve to another. An electromagnetic relay is a switch that is turned on and off by a magnetic field. It is very easy to provide electrical isolation between the coil that creates the magnetic field and the switch contacts. No power is required from the switched circuit. A solid stat relay uses semiconductor switches, transistors or switchable diodes (2 ea. SCR's or one Triac). This requires power from the switched circuit to turn on the semiconductors. If isolation between the switched circuit and control is required, that needs an optical or magnetic isolator. Electromagnetic relays can fail over time as the contacts are damaged from making and breaking the circuit. Solid state relays don't have this mechanism, but can fail more easily in over current or over voltage conditions. 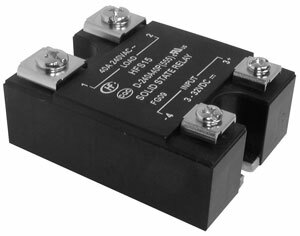 Solid state relays have been around for decades. Early version was single function, and used analog concepts to mimic the electromechanical relays. Later microprocessors were added which allowed multiple functions to be in a single relay. Today's microprocessor based relays handle many protective functions, alarming, sequence of events, PMU, and DFR functions all at the same time, and many provide protective functions that were not available just a few years ago.